One of the problems with being part of an innovation centre like CETIS is that we suffer a bit from the Dory complex. For those of you unfamiliar with this concept, it is based on the character Dory in the movie Finding Nemo who is rather easily distracted by new things. Sometimes we find that “stuff” drops off our radar as we have moved on to the next shiny thing. So it is always great when we get a chance to be involved in development for a sustained period of time. 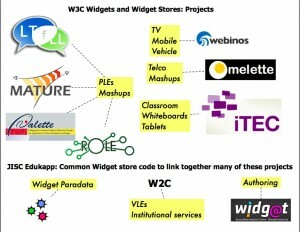 An example of this for me is the WIDGaT widget authoring tool and its development team at the University of Teesside. 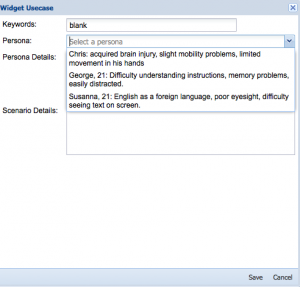 The WIDE project was part of the Jisc DVLE programme which I supported, and developed a number of fully accessible widgets. The team then got further funding and were able to develop their methodology and practice into an authoring tool for widgets. Earlier this week I joined the team and about 25 others for a “WIDGaT in Practice” workshop. We had a chance to see some examples of widget from both the HE and FE sectors and were able to get hands on and create our own widgets. Having taken part in their design bash day about 18months ago to help the team scope the design for the authoring tool, it was great to see and have a play with a useable tool which pretty much covered all the design elements the “expert” group came up with. There are a number of pre-built templates to chose from or you can start with a blank canvas. One of the common designs for widgets from practitioners has time/task management widgets to help students be more independent in their studies/life. We were shown a number of examples including a really nice simple visual reminder of key steps for each day for a student with autism and another with key stages for final year projects. The editor also includes a number of components such as embedding youtube videos and images, and social network components such as Facebook likes and comments. Examples of using these features included a widget which embedded a number of videos with a Facebook comment link so that students could share comments on content directly into their course Facebook group. There is also a simple quiz component which is proving also proving popular. The interface is pretty straightforward but I did find manipulation things a bit tricky and the team are working at improving layout options. However as a quick and easy way to develop and share resources online it does have a lot going for it. It also has a lot of design support functionality built in to help users think about what they are creating and who they are creating it for. At #cetis13 next month the team are also running a workshop at the end of day 1 where they will be actively looking for new components to add to the tool as well as any other ideas for enhancements. As the tool is open source, it is a great example for the Open Innovation and Open Development session on day 2 . Things come in three’s don’t they? And the power of three struck me this morning at the Guide Me Tours at Kelvingrove Museum session at Social Media Week Glasgow this morning. Claire McLeod from Guide Me Tours gave an overview of the app they have developed for the museum. For those of you not familiar with Glasgow, Kelvingrove is one of the city’s main museums and is consistently in the top five visitor attractions in Scotland. However like all (municipal) museums developing new income streams and improving the visitor experience is an ongoing challenge. And so to the power of three bit. The business model of Guide Me tours exploits the power of three. They develop the app (at no charge to the museum, but obviously working with museum staff) and then when the finished app is available, the income is split three ways – a third to the Apple/Android store, a third to the museum and a third to them. Seems like quite a good deal to me. The new app (available on the Apple store just now and the Android version will be available in the next few weeks) gives a two hour audio tour of the museum. 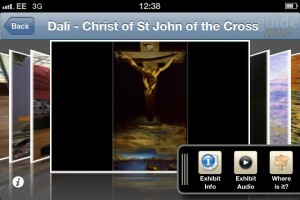 A free version gives a taster of the full experience and some of the highlights of the collection. The team are now working on extending the user experience to produce other versions which are more inclusive with features for hearing and visually impaired visitors, and different language versions. Continuing from my last post, the next part of the programme technical journey focuses on the Cluster B projects: Co-educate, SRC, P3 who had similar objectives in terms of organisational change. In terms of organisational change, SRC (Supporting Responsive Curricula) is part of larger set of project EQAL which is radically changing the way the MMU provides learning services (in the broadest sense) to its students. Other JISC funded initiatives e.g. the W2C project are connected to this major organisational change, of which SOA approaches is key. Professor Mark Stubbs’ keynote presentation at this years CETIS conference gives an overview of their overall technical approach. MMU is in the processes “introducing a new curriculum framework, new administrative systems and processes, revised quality assurance processes and new learning systems to transform the student experience” and the SRC project has been at heart of the complete revision of all undergraduate courses, through developing a processes and workflows for a common curriculum database which feeds into a range of other learning services a part of their “corePlus” learning environment provision. All course module and assessment structures have been completely revised (starting with first year and now extending to 2nd and 3rd). A new course database is now being populated using a common set of forms which provide a common set of tags (including competencies) and unique identifiers for courses which can be used a part of a wider set of “mash up” activities for students to access. When redesigning the course database, extensive stakeholder engagement and mapping was undertaking (using Archimate) in relation to QA processes which formed a key part of the project’s baseline report. A case study details this work and this blog post provides a summary of the new course documentation and QA processes including a map of the new peer review process. A key part of the project has been to explore effective ways for students to showcase their experience and abilities to employers. A number of systems have been explored and an institutional e-porfolio strategy produced. A decision has now been taken to provide institutional support for Mahara, beginning in September 2013. In terms of standards/specifications, this being MMU, XCRI is integral to their systems but hasn’t been a core part of the project. Like other projects, the institutional demand for xcri is still not widespread. However members of the team are key to developments around the integration (and thereby extension) of XCRI into other specifications such as MLO and various competency related initiatives. Now the major technical implementations have been implemented, the team are now focussing on the wider cultural changes, engagement with staff e.g. the development of the Accrediation! Board game which I’ve written about before, and evaluation. Coeducate, has taken an the almost opposite approach to MMU in terms of a top down approach to creating and managing new courses. They have connected their SITS database with their new Moodle installation see this blog post for an overview, but unlike MMU do not have a set of course templates, or the same level of automatic course population. Instead, staff now have more flexibility in terms of creating courses suited to their specific needs, as this post and linked documentation describes. The IDIBL framework has also been developing as template for course creation, however the institution has developed an alternative undergraduate curriculum framework. The team have also produced a report on approaches to developing open courses, which again should provide a useful staff development resources. Following this more bottom up approach, the team have also instigated an series of innovation support network seminars and produced a set of online resources (housed in Moodle) to support staff as new institution validation process are being introduced. Like so many of the projects being caught up in a sea of other institutional change initiatives that aren’t as tightly coupled as MMU, the project has focused effort on providing support to staff to guide them (and in turn the institution) through changes such as course revalidation. The project has been able to to influence and inform institutional strategy to initiatives such as course revalidation through some light weight data analysis of the VLE in terms of course structure, numbers and types of assessment etc. Over the past year, the team have also been exploring the Business Model Canvas tool in terms of its suitability for learning design planning and/or conceptual modelling. The flexibility of the tool has been identified as a key strength. The team have found other more specific learning design tools such as the LDSE too prescriptive. This post outlines the approach of integrating this tool within Archi (which is being developed by colleagues at the University of Bolton). The tool is currently being trialled with PGCHE students, and again will hopefully provide another design tool for the University and the rest of the community. The team have been using the tool to support staff in course revalidation process, and are lobbying for its adoption into the formal revalidation process. The team had hoped to do more work on integrating widgets into Moodle for course authoring. However staff issues and a refocus of project priorites has meant that not as much progress on this has been made as originally intended. However, over the last few months the team have been able to build a customisable 8LEM widget (more information and a link to a beta version is available here). The principles outlined in the 8LEM methodology are also the basis for the work of the Viewpoints project, and by the end of this June, it is hoped that there will be at least two versions of the widget available based on the approaches of the Viewpoints project as well as the “vanilla” version. Bolton has also been successful in gaining funding for one of the JISC Course Data projects and this project will extend work started in Co-educate. The work done through the CoEducate project has help to articulate some of the key requirements for data reporting and practical uses of data collection, including key indicators for retention and drop out. As with other projects, the challenge for the team is to ensure that the resources and approaches explored and advocated through the project continue to be embedded within institutional frameworks. The Enable project started out with the vision of connecting and enhancing institutional processes. As with all the other projects, senior management buy-in was always a critical part of the project and a Senior Management Working Group was set up to ensure this buy-in. Part of the wider institutional story has been the relatively high number of changes at senior executive level which have impacted the project. The team have shared their experiences around managing change and information processes. In terms of technologies, as well as being part of the Design Programme, the project has engaged with a number of other JISC funed initiatives. The team have been an early champion of EA approaches and have been involved with the JISC FSD EA practice group initiative. They have piloted TOGAF approaches in an Archimate pilot. Their experiences of using Archi in for their work in external examiners pilot are summarised in this blog post and embedded slides. Phil Beavouir, the developer of the Archi tool has also posted a thoughtful response to this post. If you are interested in EA approaches , I would recommend both these posts. The team have also been experimenting with a number of different ways to automate their code build, acceptance, testing and deployment processes. These tools and techniques are being adopted and used in other areas now too. Again the team have promised to share more via the blog, in the meantime a summary of the technologies they are using are detailed in the project Project prod entry. The team have been looking at Sharepoint and, another example of cross JISC programme fertilisation, were able to gain some of the benefits realisation funding for the Pineapple project to experiment with its software. An overview presentation is available here. The pilot was successful, but, at this point in time, no institutional decision on an institutional wide document management system has been made, so no further developments are being introduced in respect of this work. The team feel that the EA approaches have “enabled” them to define with stakeholders the key areas to be addressed in terms of developing effective processes. And, have found that having “just enough backing” for developments has been effective. Particularly in gaining senior management buy-in whilst Executive decisions are not possible. The project has been able to illustrate potential working solutions to recognised problem areas. They have also been sharing their experiences of EA extensively with the rest of the sector, through presentations at various institutions. Again the PC3 project has been on quite a journey over the past three and and a half years. Changes at senior management level have meant that, whilst not changing the underlying principles of the project of using coaching (as explained in its curriculum model ), the project team have had to adapt some of their anticipated approaches and have experienced delays in decisions around key institutional wide provision of technologies. A major milestone for the project has been decision to adopt PebblePad as the institutional portfolio system. The team acknowledge that there is still work to be done around the integration of resources in the VLE and in Pepplepad, in terms of the user experience of switching between systems. Perhaps Pepplepad’s planned LTI adoption will help mitigate some of these issues. The project is now reaping the rewards of their early work in staff development and are now working increasingly to support students, and their use of technology whilst implementing the PC3 coaching methodology. The approach is now embedded into the Sport Business Management Degree programme (see this post for more information) and students are playing an increasingly important role as coaching ambassadors. Earlier in the project the team had created a number of video based resources around coaching. Now they are supporting students in the creation and sharing of videos as part of their course work and as coaching ambassadors. The team are working with institutional AV staff around developing approaches to creating video resources with students. The project is also planning a conference, where students will be key contributers, and plan to video sessions and make the recordings available as a set of resources. The team are also seeing increasing use of social media sites such as Facebook for communication and even for running coaching sessions. This has very much been student driven and developments are being monitored with interest. The team have also been using a number of google products (forms and documents) for sharing of project information and for part of their evaluation by using google forms to collect session feedback. Where possible, the project are releasing resources as OER. To this end have they have benefited from the experiences of the Streamline project which was funded through the JISC/HEA Academy OER programme. Institutionally there has been a significant development around workflow of OERs with the institutional repository and the JORUM national repository that the project has benefited from. Again another example of cross programme sharing of experience. So, another set of projects with common aims but very different approaches to organisational change. In many ways, a top down approach as exemplified by MMU may well be the most effective way to gain widespread adoption. However, MMU have benefited from a more stable senior management perspective and have not had to re-articulate their vision to a different set (or sets) of stakeholders during the project lifecycle as some of the other projects have. Engaging staff and students at different levels, as Bolton and Leeds, have done may well be just as effective in terms of seeing real pedagogical change in the longer term. But whatever approach, the importance of modelling and being able to visualise, and develop conversations and engagement has been central. Over the last two months, The Open University, the University of Bolton, KU Leuven, and IMC, with funding from JISC, have been working to develop a Widget Store aimed at the UK education sector using a codebase shared across and sustained by a range of other EU projects and consortia. (see Scott’s post for more details on the technical work and getting involved). The Creating and Education App Store for the UK session at the CETIS conference, was the first opportunity for the team to share, firstly the vision of a shared codebase to underpin a range of existing and potential widget stores. And secondly, to share initial prototypes of UIs, and get feedback on the work to date and potential future development ideas from delegates. Fridolin Wild (OU) gave a useful overview presentation “the university in a box” which highlighted the work of the OU in various widget related projects and initiatives which have built on the notion of the personalised learning environment. Scott Wilson, (University of Bolton/CETIS) then set the wider context of widget developments, from W3C o the JISC DVLE programme, which is neatly encapsulated in the diagram below. One of the key parts of the work is to provide extended community building features such as ratings, comments, use cases etc. As well as providing additional support for users of the store(s), Scott also outlined plans to share this “paradata” via the JLeRN Learning Registry node (which was discussed as part of a parallel conference session). 1. Institutional use of such a store: e.g. how would you use such a store? Have a local installation or use a hosted services? Implement connectors using IMS LTI for example. 2. Tracking and Recommendation services: what would be captured? how would it be shared? How could useful analytics be captured and used? 3. Widget Authoring: led by the Widgat team a useful discussion centred around their widget authoring tool. For the conference plenary a two slide summary was produced, and look out for more details on the store over the coming months on this blog. Over the past 18 months the projects funded through the JISC DVLE (Distributed Virtual Learning Environments) programme have been exploring ways to extend their provision of teaching and learning services. The W2C and SLEP projects joined for an virtual brown bag session to give an overview of the work they have been undertaking – particularly around developing access to greater and more personalised information for students. Mark Stubbs (W2C project) started the session giving an overview of what they now call their Core+ DVLE model, aka their “mega mash-up”. With their VLE (Moodle) at the centre the team have developed a number of web services from a range of institutional systems. This is now allowing students to access a number of services such as timetabling, PC availability, reading lists etc from mobile devices. Taking this web service approach has allowed the team to use the “develop once, deploy often” approach. Consistent tagging (based on existing commonly used tags such as course IDs etc) has also been key for integration. Mark also took us through some very interesting stats around usage of the services, and the students use of mobile devices. Hugh Davies, Dave Millard and Yvonne Howard the took us through developments from the SLEP project. There are a number of similarities to be drawn to the mega mash-up approach of W2C. However a key difference being that Southampton don’t have a VLE at the centre, instead Sharepoint is at the centre of their developments, with new UIs being developed for students to access information. Using Sharepoint hasn’t been without it’s challenges, as the team did highlight, it hasn’t been as flexible as they first thought, however they are using the project to try and introduce more agile and user centred development processes into the mainstream of institutional provision of services. Being Southampton the team have also be investigating ways to increase the use of open data, and so have been spending time working with internal groups such as the Data Access Group, to try implement and develop policy around the use and sharing of data. The actual apps/services which each project has/is developing are pretty unique to each institution, however the over-arching principles and techniques could be applied to many institutions and shows that it is possible to create more distributed learning environments through the greater integration of existing systems allowing access from multiple devices. To find out more, a recording of this highly informative session is available online. More information about the DVLE programme, including links to previous online sessions is available on the CETIS wiki. Beat the January wet and windy blues by joining us from the comfort of your own desk, for a free “virtual brown bag lunch” session next Friday (13 January). 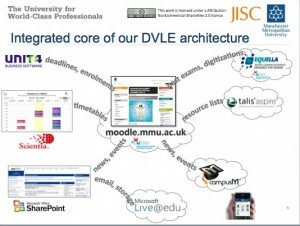 The W2C project (MMU) and the SLEP (Univeristy of Southampton) will give an overview of the work they have been doing in creating mobile web services and apps for staff and students as part of the JISC Distributed Virtual Learning Environments (DVLE) programme. Starting at 12 o’clock and lasting approximately an hour this session will give delegates an insight into the underlying technical approaches the projects have taken to providing mobile services which integrate with existing institutional systems, and also their ongoing requirements and student engagement processes. To get an overview and some background to the programme, this post gives a summary of project activity based on the last set of interim project reports. As ever the event is free to attend, and you can register your interest by using the form below. I spent part of last week at the EuroSakai Conference in Amsterdam. I haven’t really had any involvement with Sakai, and to be honest, I’ve tended to think of it as a something slightly peripheral (probably due to its low update in the UK) and dominated by the US – a sort of “it happens over there” kind of thing. However the community driven development approach it is taking is of interest, and over the past year we at CETIS have been making a concerted effort to engage more with the Sakai community and try and build more links to relevant JISC funded activity e.g. the current DVLE programme. Ian Dolphin’s opening keynote gave a really useful overview of the history of Sakai, their vision of ‘plugability’ and ease of integration of tools and services. The community continues to grow with over 330 known adopters, 71 foundation members, and 20+ commercial affiliates. (As an aside one of the more intriguing aspects of cultural diversity was the presentation from St Petersburg State University talking about their use of Sakai and how they are now working with private Islamic schools across Russia in developing their curriculum delivery). My main interest in the conference was to try and find out more about developments with their Open Academic Environment (OAE) which I know involves integration of widgets and explore potential links particularly around the JISC DVLE programme. I also wanted to get some more clarity around the differences/links/integrations between the OAE and the original CLE (Collaboration and Learning Environment). The OAE works seems to be developing apace, and it was heartening to see (and hear about) their development process which is very much user led. The project is creating and using what they call “design lenses” to guide developments. Each lens corresponds to a particular aspect of teaching and learning. The over-arching lens is conceived as a mindmap (see screen shot below) and there is a high level of alignment with work of the JISC Curriculum Design and Delivery Programmes and the challenges, processes and technologies structure of the Design Studio. The demos I saw from the project group and in particular from the team at NYU, it would appear that the OAE is a usable and flexible environment. There is also an online demo by Lucy Appert, NYU available here. Some highlights of the system were the use of widgets; tagging of content, increased levels of openness from private to shared to public; more integration with the usual suspects of external sites; integrated licencing and more. In terms of widgets we have had some interactions over the past couple of years with developers from the University of Cambridge through our early widget working group meeting. Although not taking the W3C/Apache wookie route, they were able to do some basic interoperability and repackaging to make them run in a wookie server so it might be worth the team looking at the growing number of widgets available from that community and re- purposing them. The OAE group are working towards creating templates and again, I can see lots of links to the Curriculum Design and Delivery programmes, and also to the wider context of learning design and the range of stakeholders who came to the Design Bash later in the week in Oxford. We have a wealth of case-studies and resources around staff and student engagement at a range of levels across the curriculum design process which I’m sure could be of mutual benefit. The work Robyn Hill (University of Wyoming) has been doing around templates also highlighted commonalities around the issues of shared understandings of terminology, context specific use etc, etc, which again all came up during Design Bash. The CLE is also developing with the latest version due for release in Spring 2012. Chuck Severance gave an update on developments, which have also taken a very user centric design process. Unsurprisingly given Chuck’s involvement in both communities, one of the major updates to the CLE will be the integration of the new IMS CC specification (which will incorporate basic LTI). Chuck sees this as being a (or perhaps the) “game changer” for Sakai. Despite appreciating the benefits of LTI, I’m somewhat skeptical about that in the UK context. However, if there is a rush of LTI producers and consumers of the coming 18 months then it could indeed give Sakai an edge over other systems. The OAE and CLE were talked about as being complementary, but the community is obviously in a hybrid phase at the moment until there is a complete integration. So for people thinking about adoption, they will probably need to have clear timeline of integration and release of features to their community. The OAE looks very pretty and I can see it appealing to academics – however you will need quite a bit of dedicated technical support to use it. NYU are still just piloting its use in selected courses/schools. As I mentioned earlier, Sakai doesn’t have a huge uptake in the UK but I was able to get more of an overview of the UK scene during the “Towards a common European Sakai Fishing Policy” session presented by Adam Marshall (Oxford University) and Patrick Lynch (University of Hull). Now Oxford isn’t your typical HEI however Sakai does seem to work for them. Their transition from their previous system (Boddington – hands up if you remember that one!) seems to have gone remarkably smoothly. Customization is crucial to Oxford and Sakai has afforded them the level of flexibility they require. Hull on the other hand is more representative of a typical HEI and both Adam and Patrick are keen to expand the UK user base to include more “normal” institutions. Currently the users in the UK and Ireland are Newcastle, Lancaster, Daresbury, Hull, Oxford, Cambridge, Bath and Limmerick, with Newcastle and Bath using it more as a research environment than a teaching and learning one. A UKissN (UK and Ireland Support Network) has been formed, more information is available from their blog and over the coming months they hope to produce more case studies etc of implementation to encourage interest. One phrase that did keep cropping up in various conversations over the course of the conference was “you don’t fired for choosing moodle”. I’m not sure that is the main reason for the increased migration stats we’ve seen in the UK over the past couple of years, however there is an underlying truth in there. By the same token I can’t see anyone getting fired for having another look at Sakai. So I would encourage you to go the the UKissN site, explore what’s happening and start asking questions. Obviously I haven’t been able to cover everything in the conference in this post, but as ever, I was tweeting away during the conference, and I’ve collated my tweets including lots of links here to give another view of the conference.